Properties in Greater Sydney average 4.5 out of 5 stars. Bondi Beach Dreaming Apartment - 300 m to beach with free Netflix and Stan. Property 8: Bondi Beach Dreaming Apartment - 300 m to beach with free Netflix and Stan. Sleek Pad- Balmoral Slopes - stroll Mosman & Spit Junctions - Views! Property 17: Sleek Pad- Balmoral Slopes - stroll Mosman & Spit Junctions - Views! Property 31: "Lieu de Ville Suite"
Property 41: BONDI BEACHSIDE Stand alone Semi detached apartment steps from Bondi Beach. Property 45: Funky Newtown Fab Pad! Just 3mins walk from Coogee beach and all local attractions! Property 46: Just 3mins walk from Coogee beach and all local attractions! Wake up to the best view in Sydney! Property 47: Wake up to the best view in Sydney! I can&rsquo;t really comment because we didn&rsquo;t actually stay. Unfortunately we needed to leave a car on the street and there was only 3 hour parking available. The owner did get in contact to say he could have organised alternative parking, however, we had already booked elsewhere. We had a wonderful four nights, listening to the ferries, and enjoying the incredible view of the opera house and harbour bridge. The apartment is very well equipped, and Leslee and John went well out of their way to give us a morning check in so that we could have a full day in Sydney. 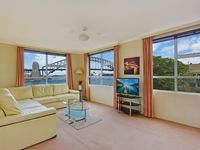 The apartment is perfectly located for the ferry, and it is just a short walk or bus ride to North Sydney train station. Four days was not long enough for this slice of heaven. Hope to be back soon.